This article should contain everything you need to setup, manage and complete Smart and Skilled reporting in Wisenet. As per the specifications you are required to complete this reporting on a monthly basis. Each Tab represents a different stage in your SaS reporting. Click on each Tab for instructions on what needs to be completed for successful reporting. If you are required to complete SaS reporting, it is important that you incorporate specific SaS field collection and processes into your Course Offer, Learner and Enrolment setup. Spending a little more time up front can save a lot of time later. This can be done in bulk or individually. Choose the right method for you. Any Unit Enrolment that has not commenced must have an Outcome Code of 85. If you do not put 85 against the Unit Enrolment it will generate errors in your reporting. Any Unit Enrolment that has not commenced must have an Outcome Code of 85. This enables the Unit to appear as Not Yet Started in your export. 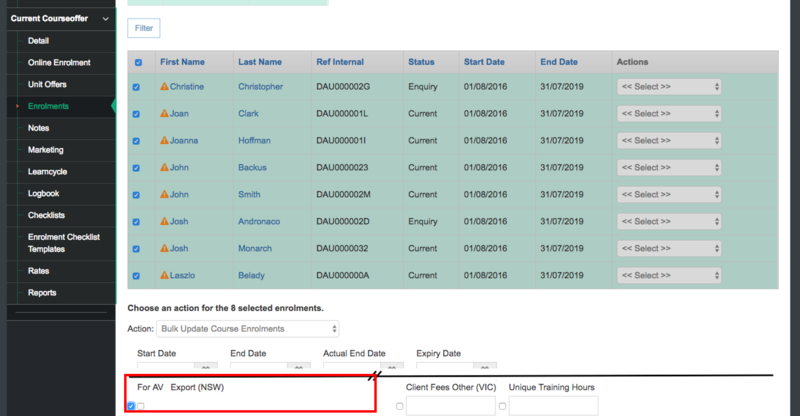 If you do not put 85 against the Unit Enrolment it will generate errors in your reporting. To report data for a Learner who has transitioned from a superseded qualification to a current (replacement) qualification, and commenced training in the current qualification, you must submit Training Activity Data which reflects the transition of training to the current qualification. Ensure that you have followed the Prepare steps before proceeding. After your AVS submission there may still be errors. These will need to be fixed prior to submitting for Smart and Skilled. Repeat Step 2 until there are no errors. After Final reporting NSW wants this record excluded from the export.